One of the houses reflected in the window of the barber shop still exists. I can’t tell from the googlemaps street view (too many leaves on the trees) if it is the one with the more complete reflection, or the partially reflected one to its right. Very nice. Love the window signs, of course. I actually live in the Westonia building now. It looks like the reflection is currently “pope house bourbon lounge”. I’m sure if someone does the research they could get more info on it. 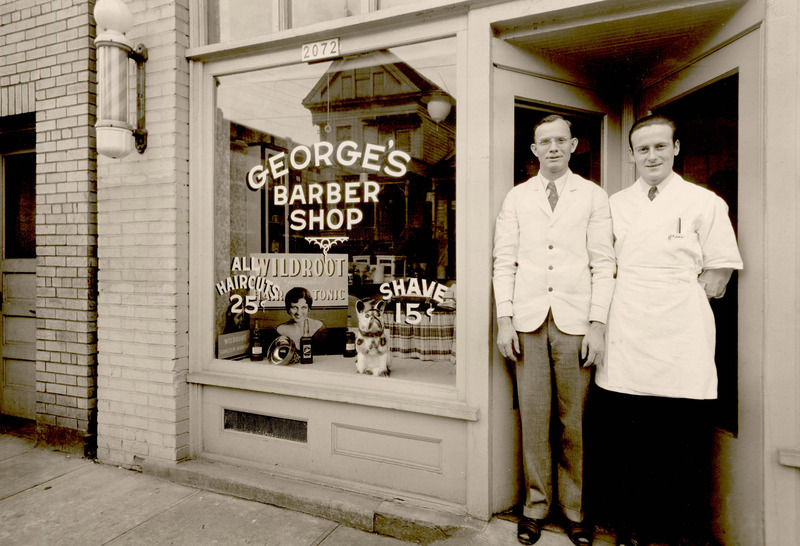 Does anyone remember a Barber shop on Corbett st in the Johns Landing area? The name if the owner was George. He was in an old building that is still there. It was close to Corbett and Iowa st. I believe. Harrys market was in the same building back in the early sixties. I remember haircuts were 50 cts. If i came back without a Crewcut, I was in trouble. I recall he had an old toilet where the tank was up on the wall, and you had to pull chain to flush it.